At least eight people are reported to have been killed in an attack on the US consulate in the Saudi city of Jeddah. Militants used explosives to break through the fortified entrance and shot their way into the compound. The dead were said to be five non-US staff, and three attackers. It was unclear whether any Saudi guards died. US President George W Bush has said the attack shows "terrorists are still on the move", trying to force the US to withdraw from Saudi Arabia and Iraq. "They want us to grow timid and weary in the face of their willingness to kill randomly," he added. A Saudi security source told Reuters news agency that heavy security had prevented the attackers from getting into the Jeddah consulate by car. Smoke could be seen rising from the compound. They then fought their way in using grenades and automatic weapons. The compound was then stormed by the security forces. 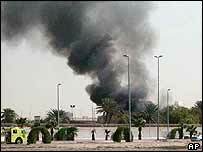 Saudi officials initially reported that four Saudi guards were killed and two others wounded in the clash. An un-named security source quoted by the French news agency AFP later denied that any had died. Two gunmen were arrested after being injured. All Americans who were at the consulate are reported to be safe. A consular employee told the Associated Press news agency that staff had been rushed to a safe area in the building. "We could hear the gunshots outside, but we didn't know what was going on," the employee said. Correspondents say security around the consulate has been extremely tight since a series of bombings by Islamic militants in Saudi Arabia began in 2003, mainly targeting buildings that house foreigners. They add that the attack must have been very well planned, given the security measures. The interior ministry said Monday's attack had been carried by a "deviant group" - a term used by Saudi authorities to refer to supporters of Osama Bin Laden. "Security forces dealt with them immediately and brought the situation under control. Three of the attackers were killed and two were arrested after they were wounded," the ministry statement added. In Riyadh, US embassy spokeswoman Carol Kalin said four of the five consular employees killed held administrative jobs, and one was a private contract guard on the consulate's payroll. Four other local consular workers have been taken to hospital with injuries, she added. The embassy and the mission in Dhahran had been closed as a precaution following the Jeddah attack, Ms Kalin said. Previous operations targeting Western interests have been blamed on groups inspired by Bin Laden's al-Qaeda network, which wants to drive all non-Muslims out of the kingdom. The last major attack was in May, when gunmen attacked oil companies and a housing compound in the eastern city of Khobar, killing about 30 people.